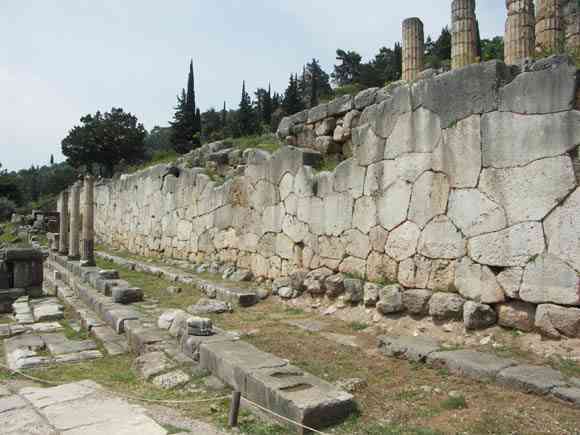 As a background to all these offerings that existed in the area between the bouleuterion and the athenian stoa operated the big polygonal wall which was built in the second half of the 6 th. cent B.C. in order to retain the land of the dike , above which the temple of Apollo was built. The wall was built from stones with curved joints that had excellent adaptation between them and give the lifeless wall a face of life and variety. Above the stones have been engraved in the hellenistic and roman age hundreds of inscriptions that indicating slaves releasing , which in this way they were under the guarantee of the god Apollo.